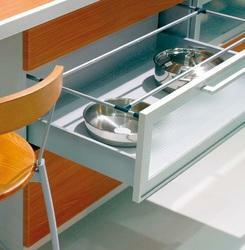 Manufacturer and Supplier of Kitchen Sliding Shelves. Our product range also comprises of Aluminium Ladders, Polycarbonate Canopy and Fall Ceilings. With an aim to stand tall on the expectations of our esteemed clients, we are providing Kitchen Sliding Shelves. The offered sliding shelves are manufactured by using supreme quality raw material and the latest technology, in sync with set industry norms. Widely used to help the home maker to finish cooking early, offered sliding shelves are highly acknowledged in the market for their various quality attributes.